It was August 2000 and we had just returned to Melbourne after three years in Canberra. Edward was four years old and his little sister, Elizabeth was eighteen months old. We settled Edward into kinder and he seemed fine albeit a bit tired. We all were, after our big move. Bath-time in our home, like most, is a set routine when you have children, except that this night we noticed that Edward had lost weight. I took him to see my GP the next day and she immediately took blood samples. I did not know at the time that she had worked in oncology in the States. When the tests came back I was sent immediately for an ultra sound of his abdomen. When the lady operating the machine wouldn’t look at me, I knew that there was something wrong. She asked me if I could get in touch with my husband and I kept asking her until she admitted there was a ‘mass’ in Edward’s stomach. In fact it turned out that the mass was 7cm x 5cm x 3cm in size, huge for such a small boy. Somehow in the next hour, we packed bags, went back to the GP and then were admitted to the Royal Children’s Hospital. In Emergency they were waiting for us. The doctors handed Edward a Hessian doll and coloured crayons. He drew a huge red blob in the stomach of the doll – how perceptive children can be. The oncologist who examined him could feel and see the tumour – it was such a shock. The next shock was being sent to 6 East. When I turned that corner from the lift, I saw children in the corridor with their ‘robots’ and little hair. “No, this cannot be the right place.” It was. After two weeks of tests to determine which type of cancer Edward had, he was diagnosed with Neuroblastoma Stage IV. It couldn’t be much worse they said, he only had a four percent chance of survival. Intensive chemo started immediately, followed by surgery in January 2001 to remove the tumour on his adrenal gland. Then radiation and more chemo, clinical trial drugs too. Weeks in the hospital, drugs whose names were unpronouncable. Vomiting, lack of sleep, no immune system all go with the treatment. It becomes your life; normal is not the normal you once knew. By May Edward was in remission – the news of this was overwhelming. We had him back. It had all been worth it. The plan now was to give Edward an anti-cancer vaccine which they hoped would stop it from returning. A collection of his stem cells took place and eventually the day came for the vaccine. When we arrived at the hospital there were lots of people milling around and asking us if we were ok. I then found out that Edward was actually the first child in the world to have this vaccine. This made the whole thing even more daunting and frightening. It wasn’t too late, we could cancel, they said. The vaccine went ahead and Edward couldn’t understand what all the fuss was about. He was always so accepting of everything. He received two of the three scheduled vaccines over a couple of months but unfortunately it wasn’t working for him. The cancer had spread to his bones. More trial drugs, chemo and radiation. His wish was to go to school and thankfully he did make it for six weeks. In his short time there, he made a huge impression on the other children and teachers and people still talk to me about him when I am there with Elizabeth. 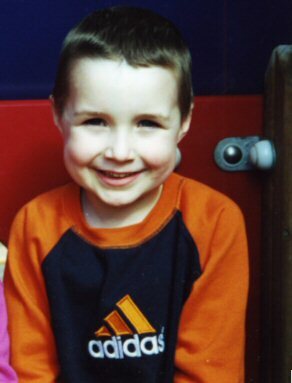 On 29th April 2002 my beautiful boy lost his fight and went to join all those other courageous children who had gone before him. He was brave and loving until the very end. Not once did he complain even when it was so obvious that he was hurting so much. He has left a lasting impression with so many people – I know that his time here was not in vain. The anti-cancer vaccine has been successful in other children so I like to think of my gorgeous boy as a pioneer. He will always be remembered as the boy who loved Harry Potter and Pokemon. The boy who loved Indian food (butter chicken was his favourite). The boy with the best PJs ever. We talk about him every day and miss him every minute. He lives on in his sister which makes me get up every morning. I love you my shining star and my pride is endless. Mummy.